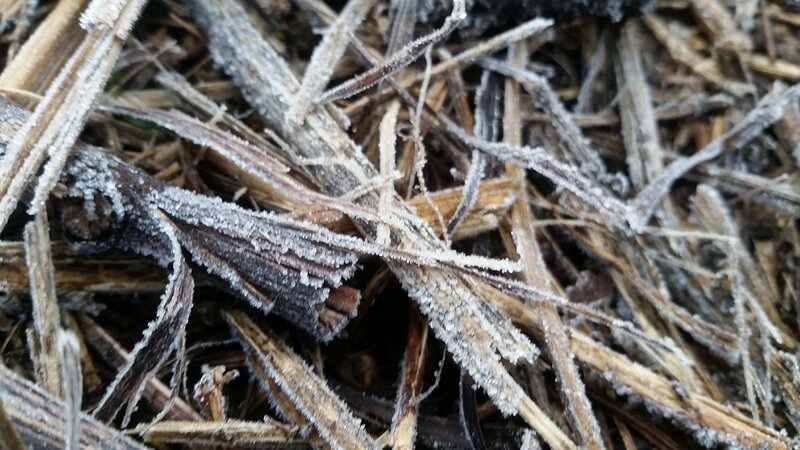 The first of the winter frosts came through last night. We spent yesterday chopping cassava stalks, making a shelter for the goats, and moving flats of tiny lettuce into the cold frame. It got later and later in the day and by the end of the afternoon we realized we didn’t have enough cover or hoops for the whole garden. The forecast was adjusted upwards anyway, so we left it uncovered and went to bed with the firelight flickering over the beams of the roof from the cracks in the stove, and the whistle of the far-off train singing through the darkness on some unknown voyage through the night. I woke confused with the chickens squawking when it still felt too dark, and I crept out of the warm covers to check on them. When I got outside I saw the sky was that uncertain color when the moonlight is still fading in the West and the East is all silvery with dawn. The stars still shone down coldly in the clear sky, and the white dogs looked pale lavender as they romped around me. 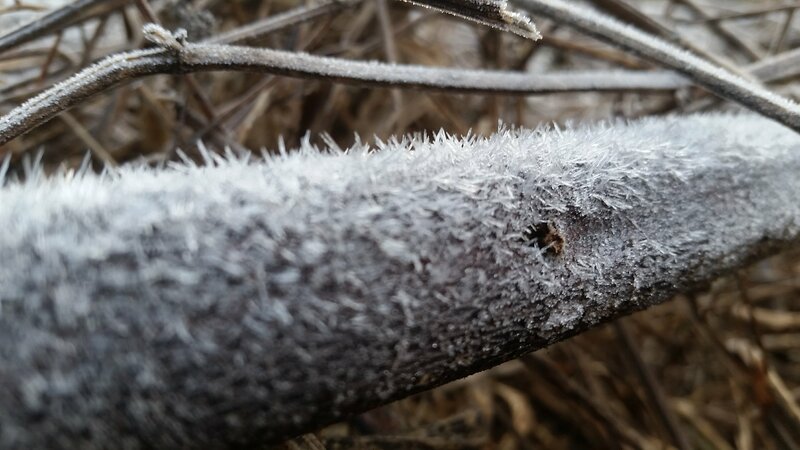 It didn’t feel very cold then through my layers of flannel nightgown and wool socks, but in the orchard where the little meat chickies were already lounging and pecking around their food dishes, the grass looked strangely flat and crunched under my shoes. It sparkled in the gentle light and I saw that overnight frost crystals had grown “like a strange and grandfather moss” all over everything. 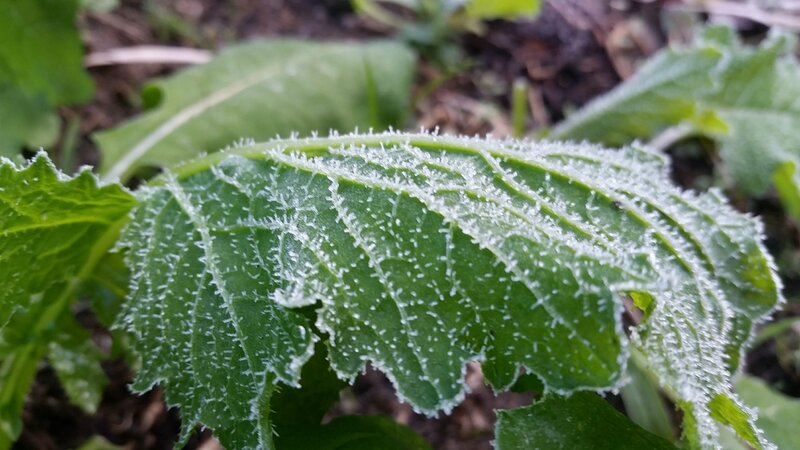 I ran to the garden, which looked dark and wilted, and when I felt the mustard leaves they were stiff and crispy with ice. Walking through the silent rows I saw hardly anything was left untouched. Dill, maybe. Some of the larger kale. 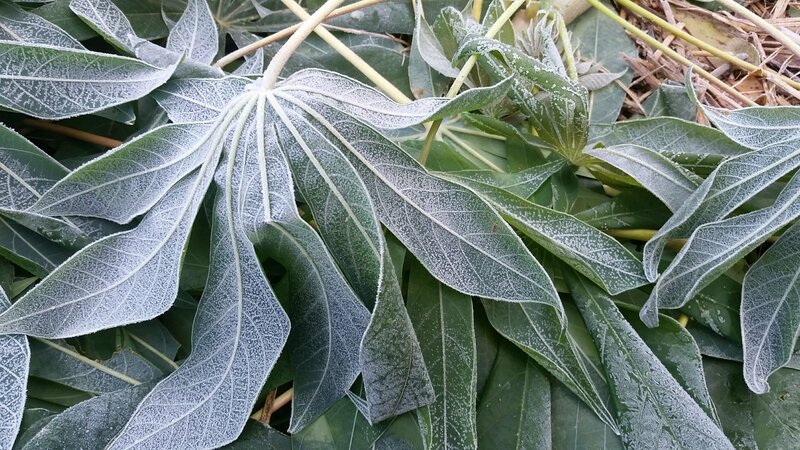 The weather changes so quickly here from hot to cold that the sudden light frosts can kill even cold-hardy plants. The light grew stronger as I felt sad for my garden, this loveliest and largest garden of them all. 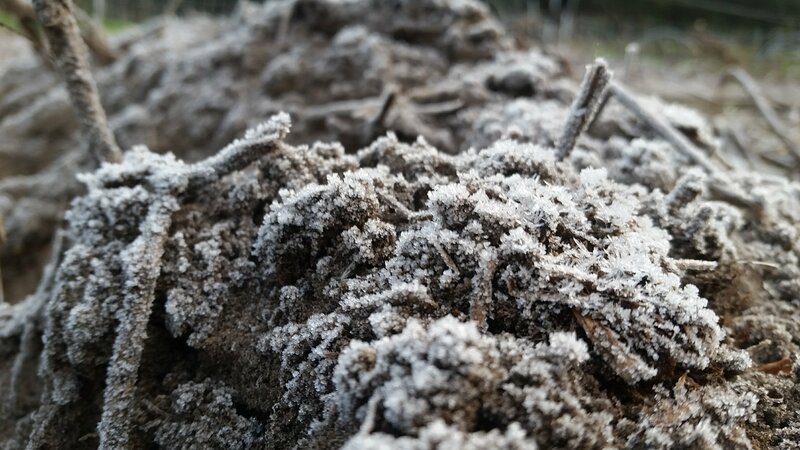 The plants looked so wretched and icebound, and besides my garden is a sanctuary. I think I can face all the troubles of the world if only I can escape from time to time to be among the good, green growing things there. 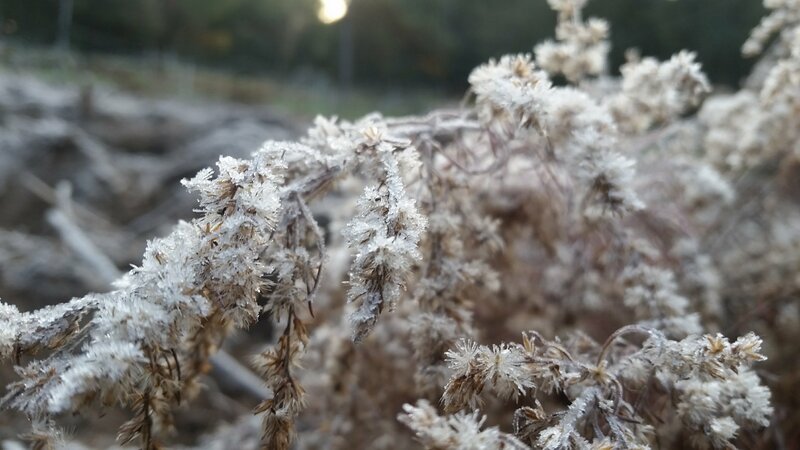 As I walked among the plants in the growing light i remembered when I read Farmer Boy by Laura Ingalls Wilder as a child, and recalled the part where a late frost nearly kills the corn. The family carries bucket after bucket of water to pour over the young plants before the sun rises and kills them. I turned on the sprinklers while the sun rose and golden light poured in through the distant oak trees. The ice slowly melted away and the geese took their chance to wander in, completely oblivious to the showering water drops and freezing cold, nibbling here and there and sampling the rye grass cover crop until i chased them out in a flurry of indignant honking. When the sun was up i turned the sprinklers off and all the plants seemed to shake themselves off and poke up their heads. Nothing was lost! (Except an hour or so of sleep). After all that tromping through the cold, how nice to settle down beside Calcifer, while the fire crackles and something delicious bakes in the oven! I made this pie for Thanksgiving last week. 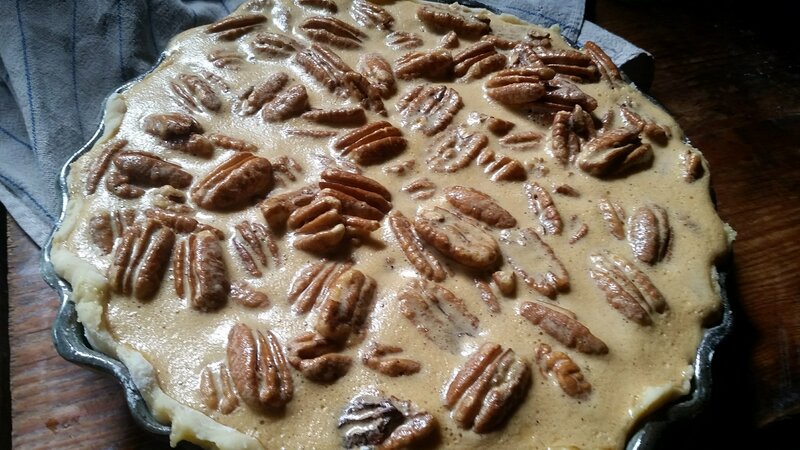 I had never made pecan pie myself, and i didn’t realize that it is so often made with Caro syrup (blech!). 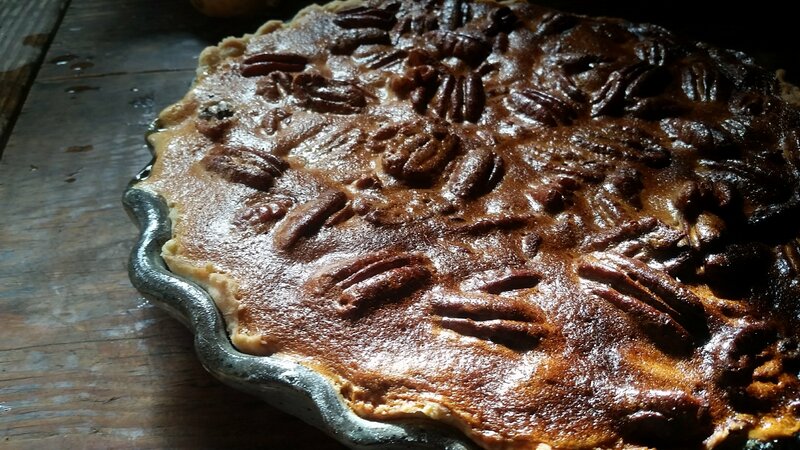 This pie was made with local cane syrup from Dudley Farm, an old homestead from the 1840’s that was made into a historic state park. The cane is grown, pressed, and carefully boiled down into syrup right there at the park. (If you would like to purchase some and see the process, come on down this weekend, there is a cane boil event from 9 am-3 pm! I will be there helping in the kitchen and doing a butter-by-hand demonstration on the back porch). The cane syrup adds the most wonderful depth of flavor. It comes out of the oven smelling like butter pecan ice cream and caramel candy. I start with a good-sized mixing bowl. I dump what looks about 4 cups of flour into it. I add a generous pinch of salt, the kind of pinch you use the flats of three of your fingers for instead of the tips of thumb and forefinger. 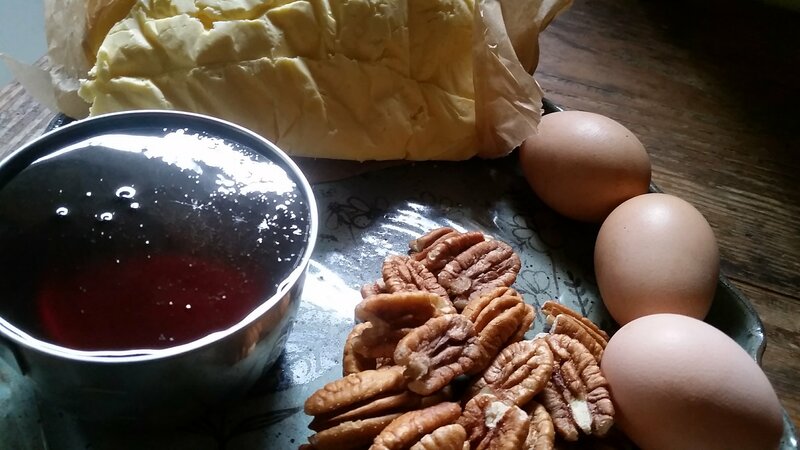 Next I add a hunk of butter about the size of a good-sized egg, the size of a mature laying hen, not a pullet egg. 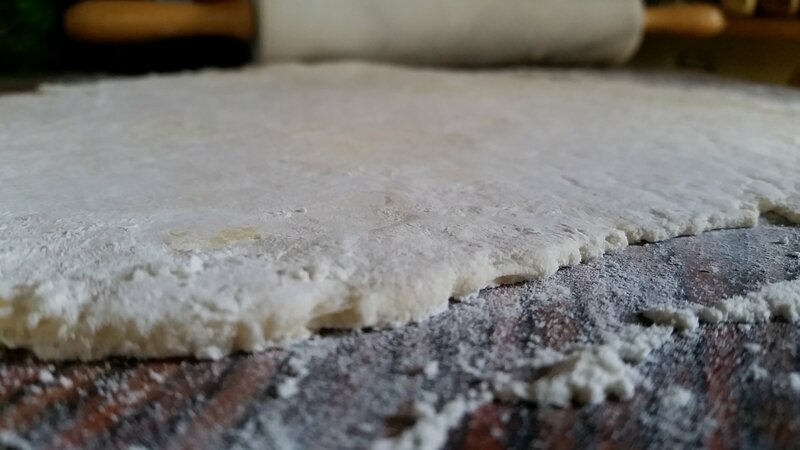 I work the butter into the flour with my fingers, crumbling it into the flour. I know it has enough butter worked it when it looks like bread crumbs but when I squeeze it in my fist it clings together in a dry, crumbly clod. I leave large crumbs for flaky texture, and small crumbs for tenderness. Now I add a splash of cream cold from the fridge, or maybe milk if we are short on cream. Sometimes water of there is no milk, but you won’t get as good of a pie crust with water. 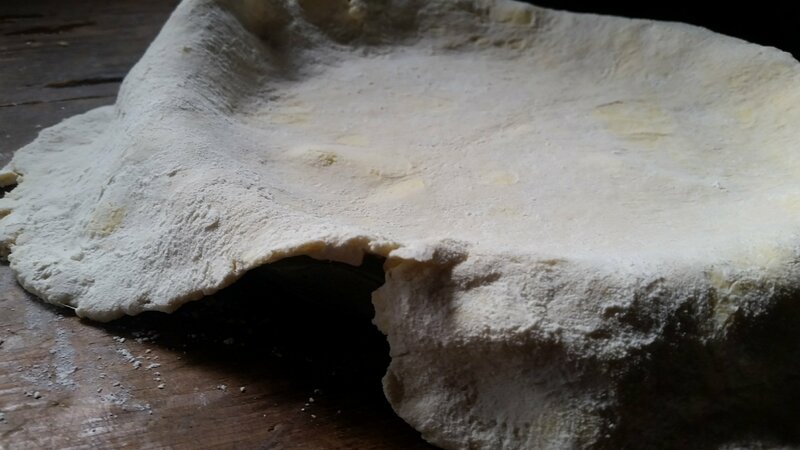 I add it very careful, so the dough won’t get too wet, kneading gently with my hands as I add it just a little splash at a time. I’ll add a little flour again if I accidentally put to big a splash in and the dough is too wet, but that isn’t ideal. It should be a rich, buttery dough that won’t stick to your hands and works easily. Beat up the eggs until they are fluffy and pale. Drizzle in the melted butter and the cane syrup. Add the salt, vanilla, and sucanat and beat in until the sugar is dissolved. 3. 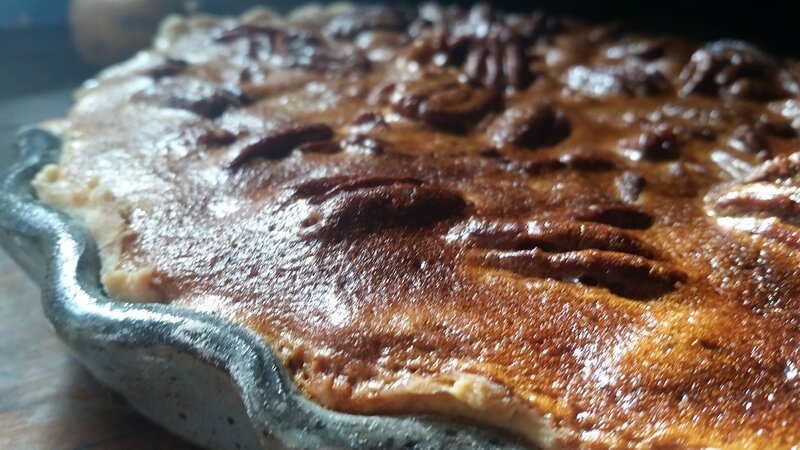 Fold in pecan halves and pour into a pie crust. 4. Bake at 350F until the pie is toasty brown (not too dark though!) on top. The filling will still be soft but will harden up as the sugar cools.